At the time the Iraq War started this month 10 years ago, millions of Americans objected to it, suspected it was unjust, and eventually came to know the truth, yet relatively few songs took on the state of the nation’s unrest or the war and its horrors. 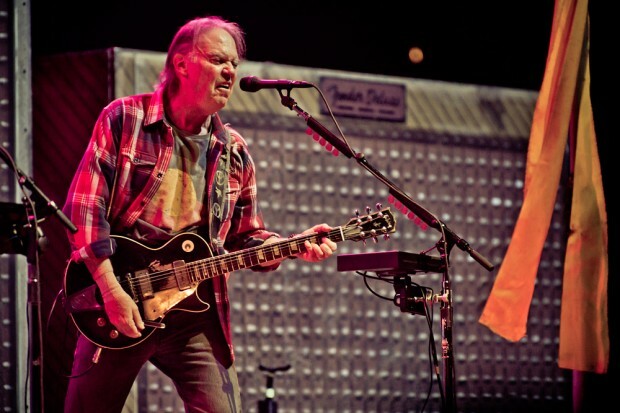 Three years into it, after the Dixie Chicks paid a very public cost for voicing their political views from the stage, Neil Young released Living With War, a concept album railing against George W. Bush and his administration. Tuning into Jim Ladd’s show on KLOS-FM one late night in April 2006, it was by accident I heard the record’s debut, during a drive home from San Diego. I knew right then the game had changed, live on-the-air, and could hardly believe my ears: This was protest music, an album’s length of it, the likes of which wasn’t being made much anymore, at least by rock’n’roll musicians. Perhaps even more strikingly, it was direct, topical and easily understood. “Let’s impeach the president for lying,” was undeniable and couldn’t be mistaken for anything other than what it was—a protest song, and a creative blast of expression and truth. At the time, Young famously declared he was surprised that younger voices hadn’t weighed in on the subjects of war and greed, but that he could no longer wait around for someone else to do it, so he went ahead and composed and recorded the songs himself. Assisted in the studio by Rick Rosas on bass, Chad Cromwell on drums, Tommy Bray on trumpet, and the 100 voices of an LA choir, the quickly written and recorded work is an everlasting document of an artist waging peace in our time. Young also launched a website, Living with War Today, and threw down a challenge to topical songwriters across the USA and around the world to write the songs of our lives: The best ones were posted, the songs remain, and the list is frequently updated. The site also carries reprints of relevant news items, a continuous tally of casualties, and links to sites like Iraq Veterans Against the War. Thank you to Neil Young and Co. for making Living With War and for maintaining the Living With War Today web resource: 10 years is far too long to be living with war in our hearts and our minds.